Ideally, you want two things: When you click on a mailto link in a Web page, you want your preferred mail service to come up on another Web page. And when you use the mail feature in a local application like Windows Explorer, Microsoft Word, or WinZip, you want that to go to your web-based email, as well. Unfortunately, I haven't found a single solution that works perfectly in both areas, but I've found some acceptable ones. In theory, Yahoo Messenger handles both mailto links and emailing from local applications, but it didn't work well either way for me. Depending on how I tried to do it, it would either set up an email message without the file attached, or it would launch a blank web page. Another problem: It's a lot of code if you don't use Yahoo's IM service. 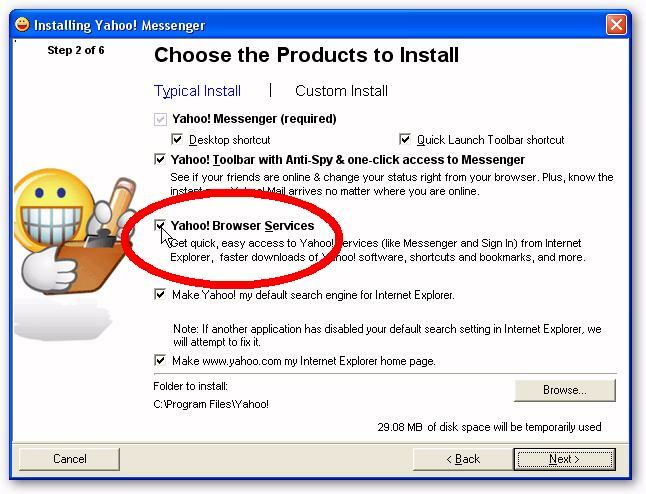 Make sure you've got this Yahoo Messenger installation option checked if you want Windows to recognize Yahoo Mail. In XP, go to Internet Explorer (no other browser will do) and select Tools, Internet Options. Click the Programs tab. In the E-mail pull-down menu, select Yahoo! Mail. In Vista, select Start, Default Programs. Click Set your default programs. Select Yahoo! Browser Services and click Set this program as default. The Gmail Notifier is sleek, easy to install, and works, but it doesn't do local applications. But it works fine with web-based mailto links. It doesn't officially support Vista, but with one exception discussed below, it worked fine for me. Firefox 3 makes it easy to assign your mailto links to Yahoo Mail. Windows applications, for both mail services. 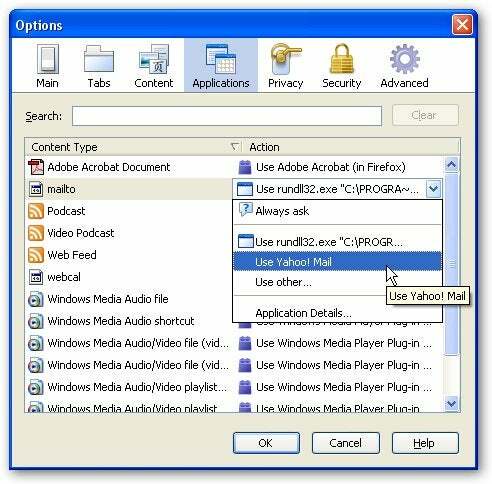 If you use Yahoo Mail, just select Tools, Options, and click the Applications icon. In the mailto pull-down menu, select Use Yahoo! Mail. Firefox 3 doesn't directly support Gmail, but you can alter it to do so. See http://lifehacker.com/392287/set-firefox-3-to-launch-Gmail-for-mailto-links for full instructions. gAttach saves the emails you start in Windows or the Web to Gmail's Drafts folder. gAttach, a free program by Chris Wood. Once you've installed it, you can click a mailto link or send mail from an application, and gAttach will create an appropriate email in Gmail's Drafts folder. Yes, that's not as convenient as opening up a message window, but it's still a big help, especially with local applications. Can you install gAttach for the local applications, and the Gmail Notifier or Firefox 3 for the mailto links? I found Gmail Notifier worked well with gAttach in XP, but not Vista; your experience may vary. Firefox 3 works just fine with gAttach, and I'm now using both of them myself. Wood has a similar program, yAttach, for Yahoo Mail users. Unfortunately, I couldn't get it to work at all. Hopefully, new versions will improve it. You can read the original forum post at http://forums.pcworld.com/message/119835.